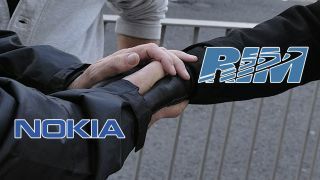 Nokia and RIM have avoided any unpleasant legal action after agreeing a settlement regarding various patents. The two firms have been sparring of late over various patent legalities, but court has been avoided as with the BlackBerry manufacturer signing off payments to its Finnish counterpart. It means that RIM will have to fork out a one-off payment – amount undisclosed – to Nokia, followed by a series of on-going cash injections into the Finn's coffers to avoid any future issues. Nokia has confirmed that all legal action against RIM has been withdrawn in the US, Canada and the UK, and is keen to point out that the payments are "all from RIM to Nokia." Zing! RIM will be trying to avoid any sort of legal scuffle in the run-up to the launch of BlackBerry 10 on January 31, which it hopes can turn its fortunes around as it has lost significant ground in the mobile market. Yesterday RIM released its finical report for the third quarter for the year, and while it managed to post a profit, it did lose 1 million users – the rot needs to stop, and fast.